After adventuring around the Old Town area of Quito for a day, we had our first encounter with agents in Ecuador’s economic development by visiting ImpaQTO, a startup business incubator in the business district. Some of my friends put it aptly — it was like we were in Kendall Square or MIT, visiting a millennial heaven of work and play. The founder Daniela showed us around, and we saw individual startups working in their offices, little skype conference rooms, inspirational murals on the walls, even little reminders of whose birthday it was this month. While thinking of the local economy in developing countries, one may not think of this picture that I’m describing. But, I think ImpaQTO exemplifies how much social entrepreneurship is taking flight nowadays. 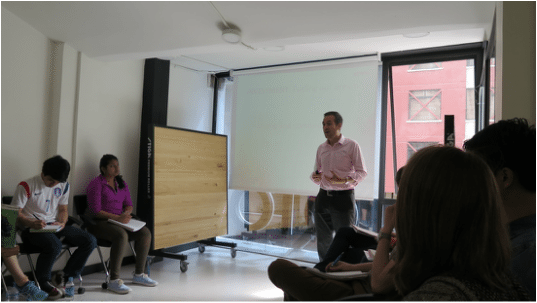 Then, Daniela gave us the background of ImpaQTO, mainly about their mission of having that coworking space, because bouncing off ideas with other entrepreneurs betters and enhances one’s product. Then, we heard from 3 individual startups that ImpaQTO works with: Waykana, Alku, and BOEM. Waykana is a tea company that uses the Wayusa leaves from the Amazonian jungle to produce tea. Juan David Gomez, the co-founder of Waykana, spoke on how his mission of spreading more energy to the world drove his purpose in creating the company. This Wayusa leaf tea has almost the same amount of caffeine as coffee, and twice the amount of antioxidants as green tea. Juan David also spoke on the local producers they work with, and how the company aims to conserve the agro-forestry practices in the region so they don’t deforest the Amazon while gathering their resources. Another interesting point he brought up was that entrepreneurs are often people with big dreams and ideas and love for people — but they often fail in having the financial, accounting skills necessary of starting a business. This shows how economic development can be advanced with the collaboration of different disciplines, an interesting takeaway that is not always apparent while studying one part of development. Then, BOEM presented their fashion company, which creates locally made garments with Latin American patterns. They have textiles from locally in Quito to in Mexico, and thus want to showcase the beauty of Latin American art to the global market. Alku went next, and it is a pet treat and toy company that uses leftover cotton waste from factories to create toys and organic ingredients for their treats. Many dogs develop cancer nowadays due to their processed treats — a new fact to many in the group. Their multiple angles of sustainability is truly fascinating and a great approach to entrepreneurship! Then, our group split up into teams and each person worked with one of these startups. Then, these startups brought their challenges to us and we all brainstormed on possible solutions. I was in a group working with BOEM with four other students. What pleasantly surprised me was how BOEM’s founders were so willing and eager to hear our naive, idealistic, but ultimately creative ideas. They discussed their challenge of fundraising, and our group brainstormed for solutions about creating purpose-driven partnerships, collaborations with bigger brands such as Zara and H&M, and other ways to create more press and media presence. I’m really excited for them to open an online shop this year, since I think the US market will really love their locally sourced and made story.